William, who started as an apprentice groundsman at the ‘Accies’ eight years ago, now finds himself in the top seat. Throughout his time he has witnessed the club promoted to the Scottish Premier League and seen the pitch transform from a synthetic surface into natural grass and then back to synthetic once more. Hamilton Academical along with Kilmarnock FC are the only two clubs in the Scottish Premier League to have synthetic surfaces, and the surfaces are not only played on by the first team but is also used by the youth teams. But as William explains, the amount of playing time can take its toll. The TigerTurf surface, which was custom built for the club, was installed to the required FIFA 2 star standard and to help William keep it in excellent condition he relies upon the SISIS Osca. 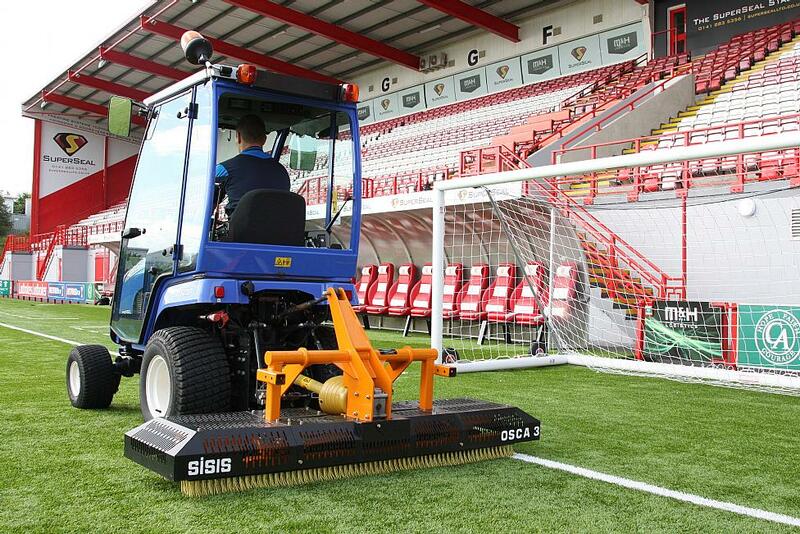 The SISIS Osca is a tractor mounted powered oscillating brush with a 1.9 meter working width and is equally effective when used on synthetic turf with sand or rubber infill. The two oscillating brushes stand the carpet fibres up and redistributes the infill evenly, minimising compaction on the surface and improving its performance – giving consistent playing characteristics while preventing pile damage caused by reduced infill levels. To complement the final result an additional brush can be fitted to the rear of the unit to help with the presentation of the pitch. A contributory factor to the reduction of compaction is that the Osca’s working width will use fewer passes than other more conventional drag brushes to complete a pitch. 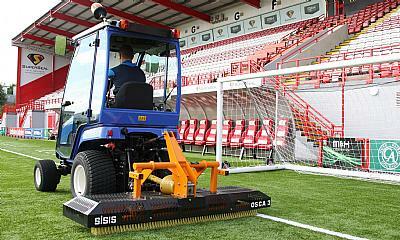 Its aggressive brushing action agitates the upper infill level of the surface from side to side as well as brushing forward, helping reduce surface compaction and encourage the fibres to stand up straight which reduces the risk of contamination, drainage problems and leaves a consistent playing surface across the whole pitch. “We’ve had the Osca for six months now and I’d say that it is the best piece of kit we’ve got here,” says William. “We’ll use it approximately four times a week – which some people may think is a lot, but for the amount of play we have here, it’s what we need. It works well in helping to get the pile to stand back up and I can honestly say it’s made a massive difference to our maintenance programme. With the pitch at the Superseal stadium having been awarded the FIFA 2 star rating, a series of stringent field tests are carried out to ensure that the quality never falters. ‘Ball roll’ is one of the tests in which the distance that the ball rolls over the surface is measured and according to William, the SISIS Osca has helped him pass these tests with flying colours. For further information or a no obligation demonstration, please contact SISIS on 01332 824 777 or visit www.sisis.com.